The hooded crane (Grus monacha) is a small, dark gray crane belonging to the family, Gruidae. The hooded crane is distributed in Russia, Mongolia, China, Japan and South Korea. Vagrant cranes of these species were observed in North America and India. These crane species are monotypic species and are considered "Vulnerable". They are listed on Appendix I and II of CITES and Appendix II of CMS. Grus monacha is closely related to G. nigricollis and G. grus. Hybrids between Grus monacha and G. grus have been recorded in China. The hooded crane is a relatively small-sized crane, measuring 100 cm in height and weighing 3,000 to 5,000 grams. The wingspan is 160 to 180 cm. Both male and female look similar. The overall plumage is dark gray. The head and upper neck have white feathers. There is a patch of bare red skin above the eye on the crown. The primaries, secondaries, tail, and tail coverts are dark gray and the legs and toes are nearly black. The eyes are orange-brown. The hooded crane juveniles have white and black feathers on the crown. Their call is a loud high-pitched and penetrating trumpeting sound. The hooded cranes inhabit isolated sphagnum bogs scattered through the taiga forests, flat river terraces, forested wetlands in mountain valleys, freshwater marshes, shallow open wetlands, natural flooded grasslands, coastal tidal flats and agricultural fields. These hooded crane species are omnivorous. The diet primarily consists of plant matter like aquatic plants, rhizomes, seeds, sprouts, roots, tubers, stems, shoots and leaves. They also feed on insects, frogs and crabs. 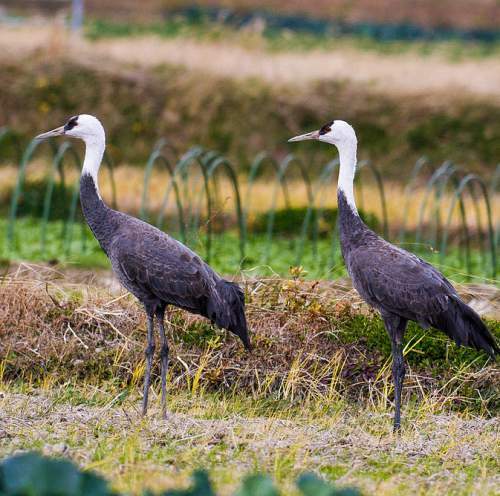 For the winter feeding grounds in Izumi, the the Government of Japan has allocated funds to feed the cranes in winter. These hooded crane species usually breed during May. They form long-lasting pair-bonds and are highly territorial during the breeding season. After courtship displays to select partners or to strengthened old bonds, the pair settles down to constructing nest with grass, rushes and weeds on raised ground. Normally one or two eggs are laid in April and May. both the male and female hooded crane take part in incubating the eggs. The male hooded crane guards the nest and chicks. The chicks are able to forage independently and they follow the parents during foraging. The breeding hooded crane populations are distributed in south-central and south-eastern Siberia (Russia), Mongolia and Heilongjiang Province of China. Most of the wintering populations are distributed in Arasaki village, Izumi (Kagoshima Prefecture) and Yashiro (western Honshu Island) in Japan. Wintering populations occur in Yangtze floodplain, Poyang, Shengjin, Chongming and Caizi in China. A small number of these crane species winter in Suncheon Bay in South Korea. Vagrant hooded cranes have been recorded in North America and northeast India (Bird Life fact sheet). The hooded cranes migrate to the wintering grounds during mid October to mid November. They stay and forage and pass the winter there from mid October to March. The return migration to the breeding grounds occurs in March-April. The global population of these hooded crane species is estimated to be 11,600 individual birds. The overall population trend is on the decline. The degradation and loss of wetlands and marshes in the breeding grounds as well as degradation of grasslands and reclamation of wintering grounds for dam building are the major threats to the survival of these crane species. Pesticide poisoning, increased levels of human disturbance, poaching and hunting of breeding birds are the other threats faced by these crane species. The CMS (the Convention on the Conservation of Migratory Species of Wild Animals) has listed these crane species on Appendix II. The CITES (the Convention on International Trade in Endangered Species of Wild Fauna and Flora) has listed them on Appendix I and II. 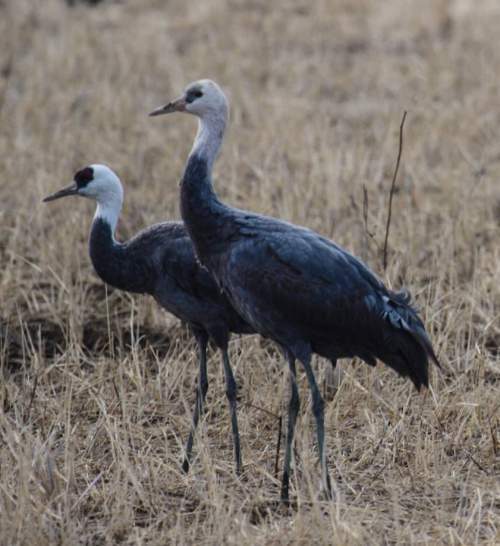 The IUCN (International Union for Conservation of Nature) has categorized and evaluated these hooded crane species and has listed them as "Vulnerable". Current topic in Birds of India: Hooded crane - Grus monacha. The black-necked crane (Grus nigricollis) is a medium-sized crane belonging to the family, Gruidae. The black-necked crane is distributed in Asia. It breeds on the Tibetan Plateau, Bhutan and the north most parts of India. It is the State bird of the Jammu and Kashmir state in India. 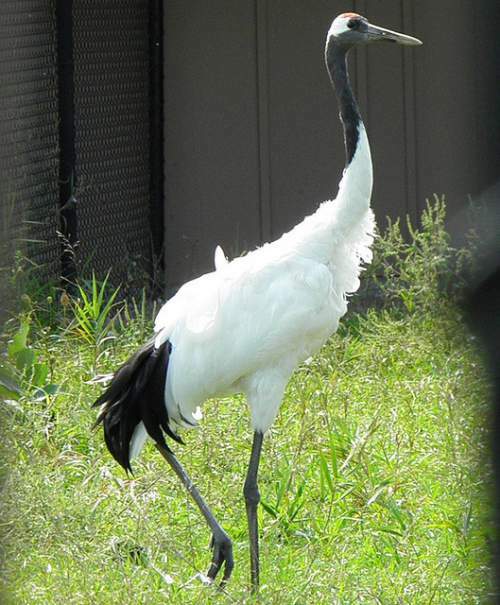 These crane species are monotypic species and are considered "Vulnerable". It is listed on Appendix I of CITES. Grus nigricollis is closely related to Grus monacha (hooded crane). 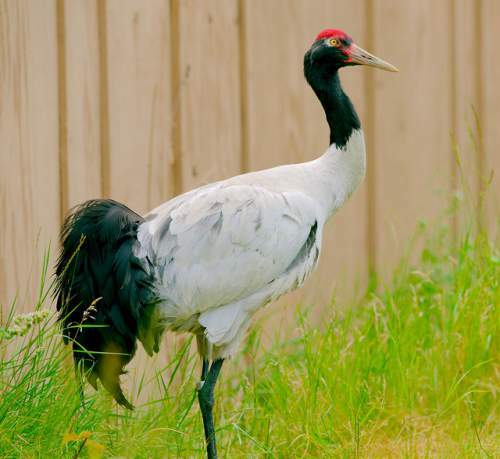 The black-necked crane is a medium-sized crane, measuring 120 to 140 cm in height and weighing 5,000 to 7,000 grams. The wingspan is 200 to 235 cm. Both male and female look similar. The overall plumage is whitish gray. It has dark blackish primaries and secondaries. The head, upper neck, tail and legs are black. The lores and the crown are bare and reddish. In breeding pair, this area becomes bright red. There is a white patch of feathers behind the eye. The iris is pale yellow. Their call is a loud high-pitched and penetrating trumpeting sound. These crane species inhabit alpine bog meadows, riverine marshes, wetland habitats associated with lakes and reservoirs, grassy wetlands and barley and wheat fields. These black-necked crane species are omnivorous. The primary diet of these crane species is plant matter like rhizomes, seeds, sprouts, roots, tubers, stems, shoots and leaves. They are known to feed on agricultural crops like barley and also fallen grains of barley, oats and buckwheat. Sometimes they dig up and feed on potatoes, carrots and turnips. Their diet includes insects, frogs, crabs, rodents. These black-necked crane species usually breed during May. They form long-lasting pair-bonds and are highly territorial during the breeding season. The pair construct nest with grass, rushes and weeds on raised ground. Normally one or two eggs are laid in May-June. The chicks are able to forage independently and they follow the parents in foraging. These black-necked crane species breeds on the Qinghai-Tibetan plateau in China and adjacent Ladakh in India. Wintering populations inhabit Bhutan, Arunachal Pradesh (India) and Tibet (China). 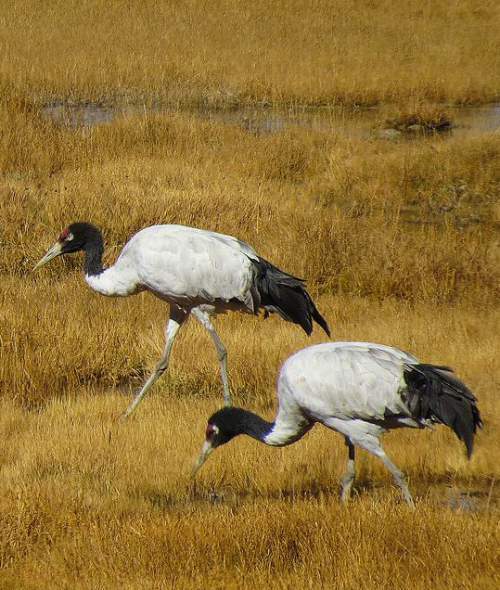 The black-necked crane move to breeding grounds in high altitudes in Tibetan plateau and Ladakh during Summer. The wintering movement occurs during early September to December and they move to lower altitudes in Bhutan, Arunachal Pradesh (India) and Tibet (China). 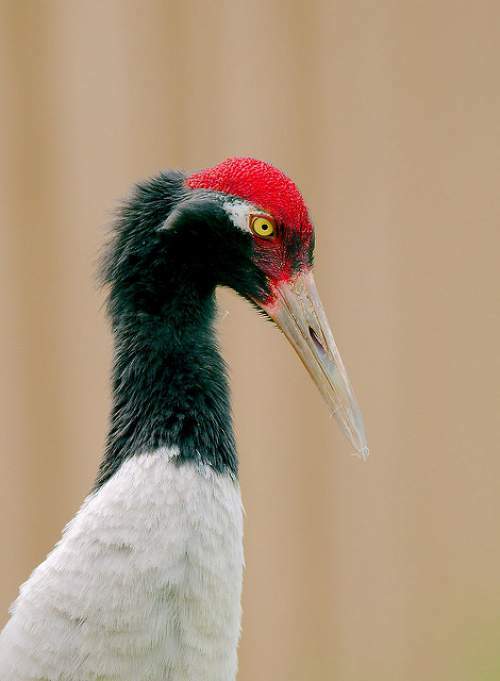 The global population of these black-necked crane species is estimated to be around 10,000-11,000 individual birds. The overall population trend is on the decline. The degradation and loss of wetlands and marshes due to human activities, degradation of grasslands, disturbance from tourism and recreation, pesticide poisoning, hunting and collisions with power lines are the major threats to the survival of these crane species. The IUCN (International Union for Conservation of Nature) has categorized and evaluated these black-necked crane species and has listed them as "Vulnerable". Current topic in Birds of India: Black-necked crane - Grus nigricollis. The common crane (Grus grus) is a medium-sized crane belonging to the family, Gruidae. The common crane is also known as the Eurasian crane. It is distributed in the Indian subcontinent, Asia, Africa and Europe. 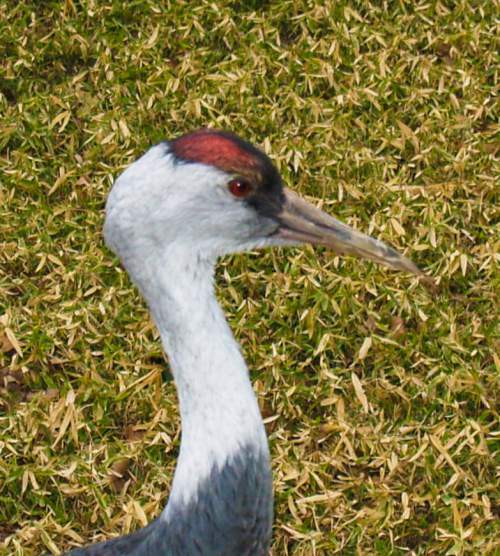 There are two recognized subspecies of these crane species. The two recognized subspecies of Grus grus are: G. g. grus (Linnaeus, 1758) and G. g. archibaldi Ilyashenko & Ghasabyan, 2008. Grus grus was earlier included in genus Ardea. The common crane is a medium-sized crane, measuring 100 to 130 cm in height and weighing 3,000 to 6,000 grams. The wingspan is 180 to 240 cm. The overall plumage is slaty gray. The forehead and the region between eye and the bill (lore) are dark, blackish. The crown is bare and red. A white streak extends from behind eyes to the upper back. The primary feathers, the tips of secondary feathers, the tip of the tail are black. The iris is orange and the pointed beak is grayish yellow. The long legs of the crane are pinkish gray. Their call is a loud piercing trumpeting sound. These crane species inhabit taiga forest (boreal forest or snow forest), shallow wetlands, swampy openings among pine forests, wooded swamps, treeless moors or bogs, flooded plains, paddy fields and pastures. These species are omnivorous. The primary diet of these crane species is plant matter like rhizomes, seeds, sprouts, roots, tubers, stems, shoots and leaves. They are known to feed on agricultural crops like peas, potatoes, olives and pods of peanuts. They also feed on insects, frogs, crabs, rodents and small birds. These crane species usually breed during May. They form long-lasting pair-bonds and are highly territorial during the breeding season. The pair build a large nest, sometimes nearly one meters in diameter. Grass and reeds are used for nest building. It is constructed high enough to keep out the surrounding water. Normally two eggs are laid in the nest. Incubation is mostly done by the female. The chicks hatch out in 30 days. The chicks are fed by the parents for a few days and then the chicks start following the parent and become independent in feeding. The crane subspecies G. g. grus is distributed in East Europe, Far east Russia and Northeast China. This population winters in France, Spain, Portugal, North Africa, Middle East countries, India, Pakistan, Myanmar, Vietnam, Thailand and Southeast China. The subspecies G. g. archibaldi is distributed in Turkey, Georgia, Armenia and Iran. The common crane is a fully migratory species. The wintering migration occurs during July to early September. The return migration to breeding grounds occurs during late-April. The global population of these crane species is estimated to be around 360,000 to 370,000 individual birds. The overall population trend is uncertain as there is decline in some populations and in others there is increase in number. The degradation and loss of wetlands and marshes due to human activities like agricultural expansion and dam construction, disturbance from tourism and recreation, pesticide poisoning, hunting and collisions with power lines are the major threats to the survival of these crane species. 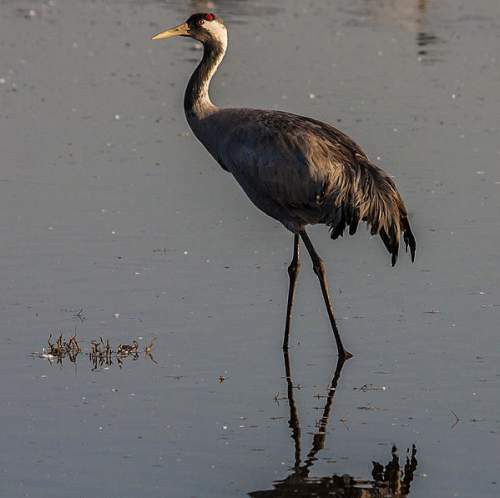 The IUCN (International Union for Conservation of Nature) has categorized and evaluated these common crane species and has listed them as of "Least Concern". Current topic in Birds of India: Common crane - Grus grus. The sarus crane (Antigone antigone) is the tallest flying bird belonging to the crane family, Gruidae. The sarus crane is non-migratory and is adapted to human presence, especially in India. It is distributed in Indian subcontinent, Mainland Southeast Asia and Australia. There four recognized subspecies of sarus crane of which one is extinct. The four recognized subspecies of Antigone antigone are: A. a. antigone (Linnaeus, 1758), A. a. sharpii (Blanford, 1895), A. a. gillae (Schodde et al., 1989) and G. a. luzonica Hachisuka, 1941. The subspecies A. a. luzonica (Luzon sarus crane) is now extinct. The sarus crane is a tall bird, measuring 180 cm in height and weighing 6,000 to 12,000 grams. The wingspan is 220 to 280 cm. The male bird is slightly larger. The overall plumage is gray, the primaries being blackish and secondaries being mostly gray. The mid-neck and tertials are whiter. The head and upper neck have bare reddish skin. The crown region is grayish. The bill is long, pointed and greenish gray. The long legs of the crane are pinkish red. The red skin on the head and upper neck and the reddish legs turn very bright red during the breeding season. The tips of the wings are dark gray. In flight the neck is held straight and the long legs trail behind. Their call is a high-pitched trumpeting sound. 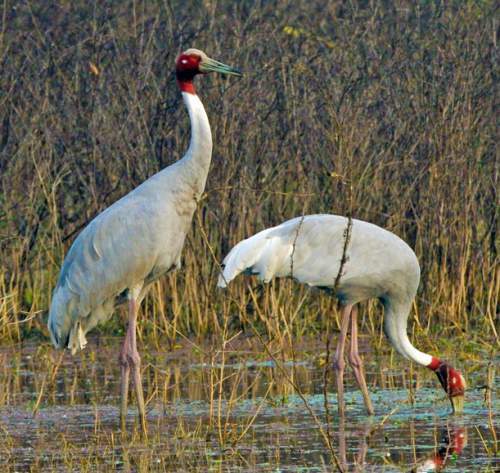 These Sarus crane species inhabit marshes, wetlands, agricultural fields, open grass lands, flooded plains and eutrophic lakes. In India there is increased association with flooded paddy fields. 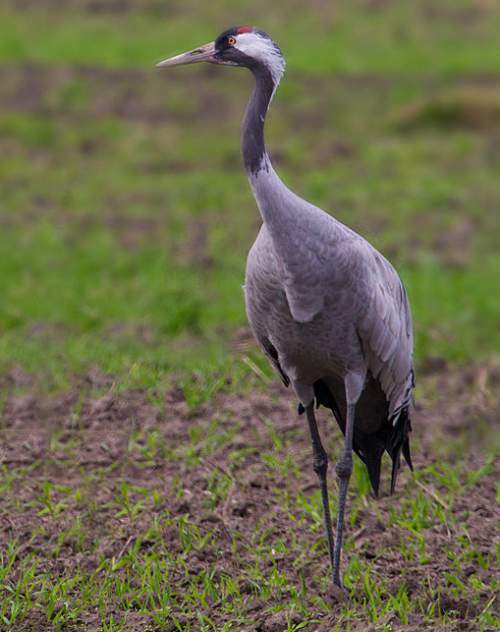 The primary diet of these crane species is plant matter like roots, rhizomes, submerged leaves, cereal crops, groundnuts, seeds, bulbs, tubers, aquatic plants and sprouts. They also eat insects, fish, shrimp, crabs, frogs and grasshoppers. These crane species usually breed during July to October, the monsoon period. They form long-lasting pair-bonds and are highly territorial during the breeding season. The pair build a large nest, sometimes nearly two meters in diameter. Grass and reeds are used for nest building. It is constructed high enough to keep out the surrounding water. Normally two eggs are laid in the nest. Both the parents take turns to incubate the eggs. The chicks hatch out in 30 days. The chicks are fed by the parents for a few days and then the chicks start following the parent and become independent in feeding. The crane subspecies A. a. antigone is distributed in Pakistan, North India, Nepal and Bangladesh. The subspecies A. a. sharpii is distributed in Myanmar, Cambodia, Laos and Vietnam. The subspecies A. a. gillae is distributed in Australia. The crane subspecies A. a. luzonica was once present in Luzon in the Philippines. The last reports of this species were from the 1970's. The sarus crane is resident species. They may make short distance movements during floods and drought. They may make local movements for foraging and breeding. The sarus crane global population is estimated to be around 19,000 to 21,800 individual birds. The overall population trend is considered to be alarming as there is steady and fast decline. They are considered vulnerable species. 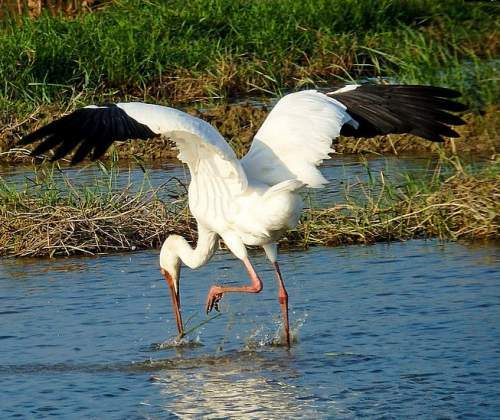 The degradation and loss of wetlands and marshes due to human activities, hunting, collection of eggs and chicks and environmental pollution are the threats to the survival of these crane species. 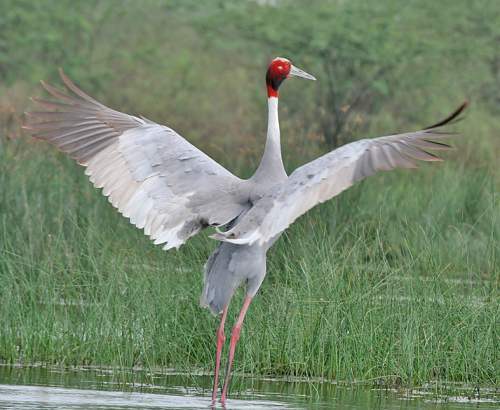 The IUCN (International Union for Conservation of Nature) has categorized and evaluated these sarus crane species and has listed them as "Vulnerable". 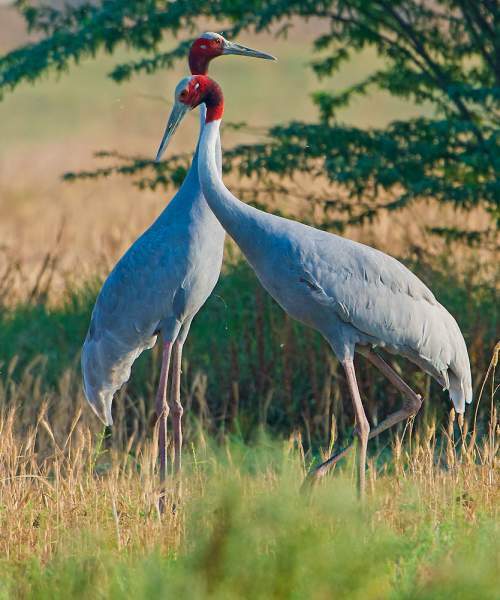 Current topic in Birds of India: Sarus crane - Antigone antigone. The Siberian crane (Leucogeranus leucogeranus) is a large bird belonging to the crane family, Gruidae. The breeding populations of Siberian crane occur in Arctic tundra of western and eastern Russia. The eastern populations migrate to China in winter. The western populations winter in Iran and India. However the last wintering population in India was recorded in the year 2002. Probably this particular group had become extinct. Leucogeranus leucogeranus was formerly placed under genus Grus and later under genus Sarcogeranus or Bugeranus. These cranes are monotypic species. 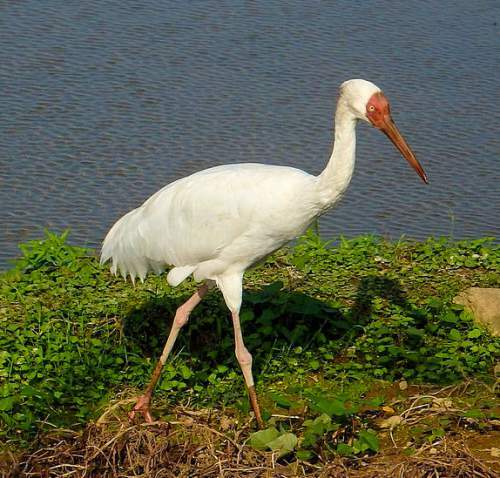 The Siberian crane is a large bird, measuring 140 cm in length and weighing 5,000 to 8,500 grams. The wingspan is 200 to 230 cm. The male bird is slightly larger and both the male and female cranes have similar plumage. Except for the black primaries, the plumage is snow white. The fore-crown, face and side of head have dark red mask extending from the base of bill to behind the eye. The bill is dark gray. The iris is pale yellow. The legs are long and pinkish red. The juvenile crane has feathered mask and cinnamon plumage with white patches. Their call is a flute-like musical sound. These Siberian crane species inhabit wide expanses of shallow fresh water, slow-flowing rivers, eutrophic lakes, moss-covered marshland, wetland depressions with unrestricted visibility and flooded plains. The primary diet of these crane species is plant matter like roots, rhizomes, submerged leaves, seeds, bulbs, tubers, aquatic plants and sprouts. When the vegetation is covered by snow, the diet of crane shifts to food of animal origin like insects, fish, birds, rodents and other small animals. These crane species usually breed during late May to mid-June in Russia. Large nest of 50 to 80 cm diameter is constructed with grass and sedge near water. Normally two eggs are laid. The female crane incubates the eggs and the male stands guard nearby. Only one chick survives due to aggression between the fledglings. These crane species occur as two distinct populations, Arctic East Siberian (between the Yana and the Alazeya rivers in Yakutia) group and West Siberian (the river basins of the Ob, Konda and Sossva) group. The wintering eastern population occurs in Yangtze River and Lake Poyang in China. The western wintering population occurs in Iran (Fereydunkenar near Caspian Sea). 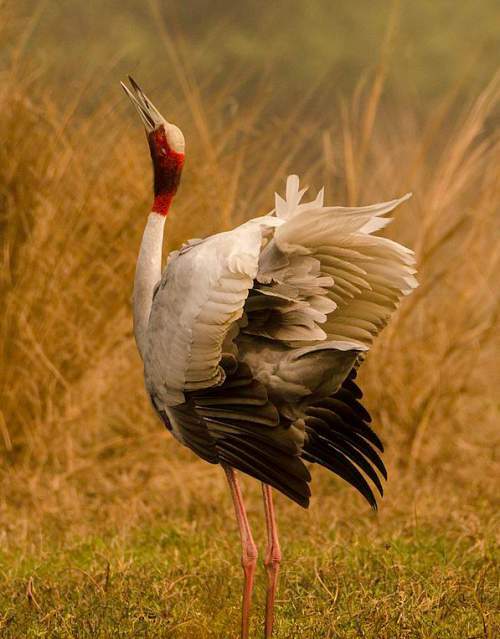 The small crane population, which used to winter in India ( Keoladeo National Park), had last seen in the year 2002. Probably it is extinct. 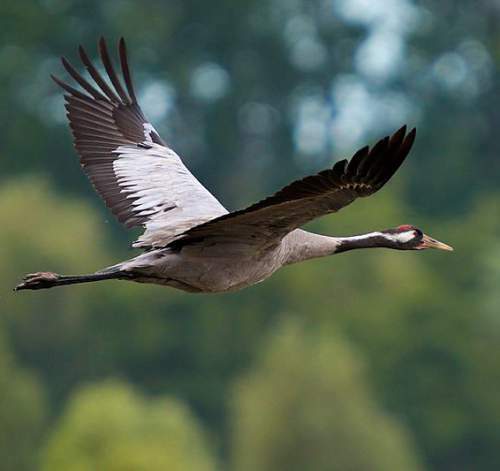 The eastern crane populations migrate to China for wintering. The West Siberian population migrates to Iran for wintering. The wintering southward movements occur during September to December. The migration towards breeding grounds occurs in March and April. 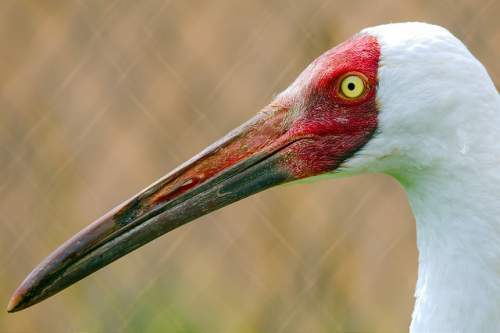 These Siberian crane species global population is estimated to be around 3,500 to 4,000 individual birds. They are legally protected in all the eleven range states under CITES (the Convention on International Trade in Endangered Species of Wild Fauna and Flora). The overall population trend is considered to be alarming. They are Critically Endangered. 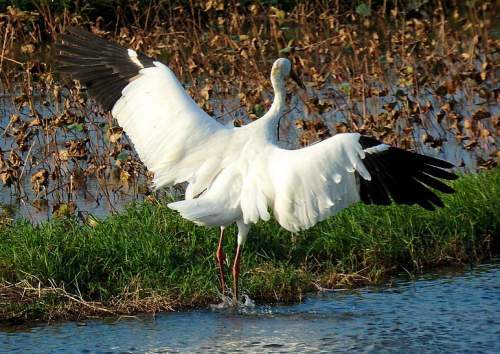 The loss of wetlands and marshes due to human activities, hunting, poisoning, pollution from oil and petroleum are the threats to the survival of these crane species. The IUCN (International Union for Conservation of Nature) has categorized and evaluated these Siberian crane species and has listed them as "Critically Endangered". Current topic in Birds of India: Siberian crane - Leucogeranus leucogeranus. The common coot (Fulica atra) is a medium sized water bird belonging to the crake and rail family, Rallidae. The Common coot is distributed in Europe, Africa, Asia, Indian subcontinent, Southeast Asia and Australia. It inhabits slow moving water bodies, pools, ponds, reservoirs, barrages, rivers, river delta, fishponds and freshwater and saline lagoons. There are four recognized subspecies of the common coot. The four recognized subspecies of common coot are: F. a. australis Gould, 1845, F. a. atra Linnaeus, 1758, F. a. novaeguineae Rand, 1940 and F. a. lugubris S. Müller, 1847. Fulica atra is closely related to F. cristata, F. alai, F. americana, F. leucoptera and F. ardesiaca. The common coot is medium sized bird, having partial webbing on their long strong toes. It weighs 600 to 1200 grams and its total length is 35 to 40 cm. It has largely black plumage, which is paler in young birds. The adult birds have a white frontal shield. The bill is whitish or very pale pink. The legs are shorter and stronger when compared to other rail species and are greenish gray in color. The coot hatchlings have reddish plumage on the head and face. Its call is a loud hissing, crackling or trumpeting sound. These common coot species inhabit slow-flowing rivers, eutrophic lakes, ponds, water bodies with marginal, submerged, emergent or floating vegetation, creeks, open marshes, saline estuaries, fish ponds and flooded plains. The primary diet of these coot species is plant matter like algae, the vegetative parts of aquatic plants and reeds, grass, seeds, cereal crops, flowers, berries, buds and moss. They also feed on small fiish, mollusks, shrimp, aquatic insects and larvae, small frogs, small birds and mammals. Their feeding habit includes grazing on land, near water-edge or diving in water. These coot species usually breed during February to September in Europe. In the Indian subcontinent they breed during May to September. The nest is made with plant material like reeds, leaves and grass. The nest is constructed as floating nest, raised platform or on bushes and trees up to three meters above the water. The clutch may have up to ten eggs. There is much mortality among the coot chicks due to predation and starvation. The young coot chicks are highly dependent on parents for food. The common coot subspecies F. a. atra is distributed in Europe, North Africa, Central Asia, Indian subcontinent, Japan, Southeast Asia and Philippines. The subspecies F. a. lugubris is distributed in Indonesia (East Java) and New Guinea. The subspecies F. a. novaeguineae occurs in New Guinea. 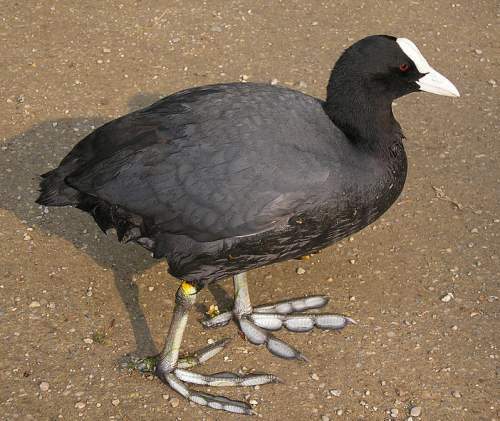 The subspecies F. a. australis (Australian Coot) occurs in Australia, New Zealand and Tasmania. These coot populations are mostly resident. The northern populations in Europe and Asia are fully migrant and make wintering southward movements from mid-August to November. The return movement to the breeding grounds occurs from February to May. The resident coot species move locally within their range for foraging and breeding. These coot species global population is estimated to be around 8,900,000-9,800,000 individual birds. The overall population trend is considered to be decreasing. However, as it has a very large range, it is considered not Vulnerable. The loss of wetlands and marshes due to human activities is the main threat to the survival of these coot species. Hunting, poisoning, pollution from oil and petroleum, drowning in freshwater fishing nets, predation by introduced species of carnivores and avian influenza are the other threats to its survival. 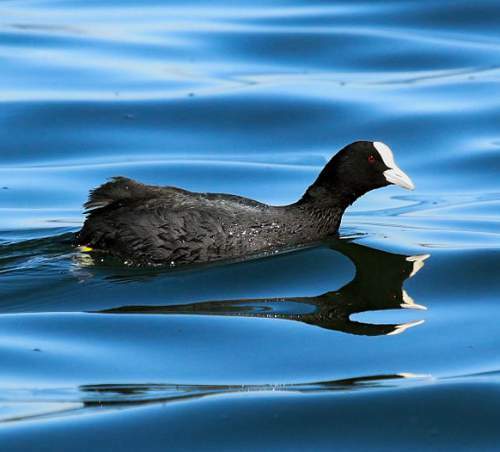 The IUCN (International Union for Conservation of Nature) has categorized and evaluated these coot species and has listed them as of "Least Concern". Current topic in Birds of India: Common coot - Fulica atra.